Healthcare is an expansive and continuously evolving industry, which benefits from a diverse workforce. That’s why Southern Illinois University Edwardsville hosted 32 high school students from Illinois and Missouri during its collaborative Healthcare Diversity Camp held June 18-22. Campers explored career possibilities in a variety of healthcare fields through hands-on activities and mentorship sessions hosted by the SIUE Schools of Pharmacy (SOP) and Nursing (SON), the SIU School of Dental Medicine (SIU SDM) and the SIUE School of Education, Health and Human Behavior’s nutrition program. This year’s camp was strengthened by a partnership with the Area Health Education Center (AHEC) Network of Southern Illinois. Healthcare Diversity Camp inspired diverse high school students by introducing them to careers in healthcare and college life at SIUE. Campers engaged in interactive activities, learned about global opportunities, toured SIUE and its program areas, and finished the week with an ACT crash course. 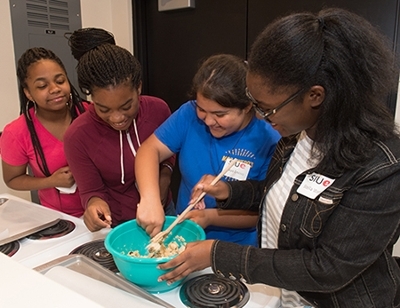 On Monday, campers visited leaders from the SIUE nutrition program and learned how to become a registered dietitian. In the University’s new nutrition lab, they read food labels, created meals based on certain dietary criteria and created and assessed products made with alternative ingredients. At the SON on Tuesday, the high school students learned of the various roles in the field of nursing and participated in hands-on learning in the nursing simulation center. 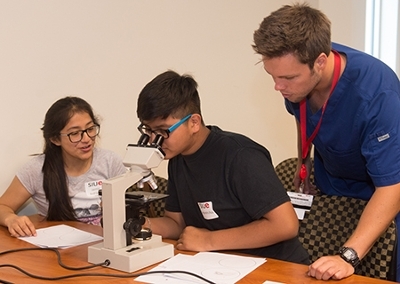 Wednesday’s activities revolved around dentistry, as campers traveled to the SIU SDM for a day of interactive experiences led by faculty and volunteer students. The day was organized by SIU SDM faculty members, including Drs. Anita Joy, Kathryn Carter, Donald Reed, Kevin Rowland, Cornell Thomas, Danny Welch and Joseph Sokolowski. Rowland emphasizes the value of interactive experiences in exposing students to in-depth knowledge of the body and introducing them to the necessary skillset. These opportunities, he says, reveal talents that students may not have realized they possess. The SOP hosted the camp participants on Thursday. Students learned about global opportunities and the importance of communication through a patient counseling discussion and activity. Photos: Students had the opportunity to work in SIUE’s nutrition lab as they learned about the work of registered dietitians. 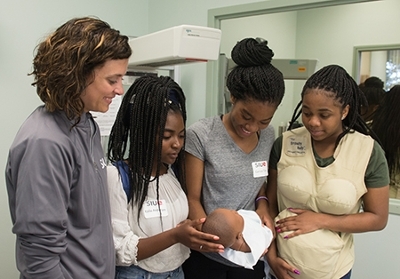 Healthcare Diversity Camp participants learned about pediatric care in the School of Nursing’s simulation center. SIU SDM first-year student Christopher Haas works with Healthcare Diversity Camp participants at a learning station. 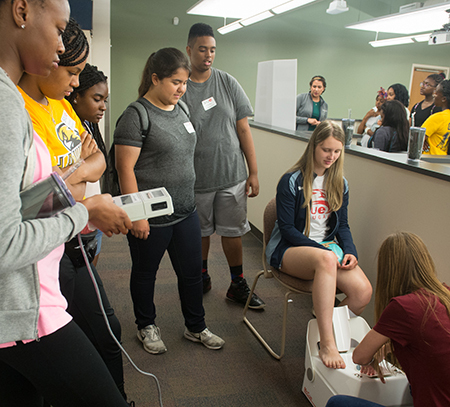 Healthcare Diversity Camp participants learned about some of the physical assessments performed by pharmacists during their visit to the SIUE School of Pharmacy.